Rare white sandy beachfront property in quiet position Ngunguru. Absolutely stunning views up the river, to the sandspit and seaviews to Goat Island and beyond. Freestanding deck at front of lawn for outdoor dining or watch the kids swimming and playing in the sand dunes right below you. Very safe swimming for little ones at high tide. Knee deep water. Ngunguru is the ideal location for exploring the Tutukaka Coast. 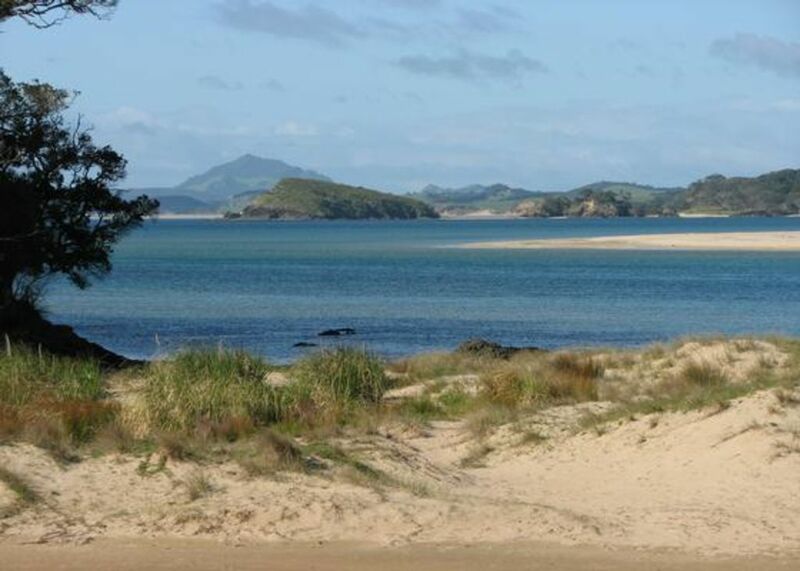 Situated close to Whangarei, yet the first of many beautiful beaches on the coast road. For MORE photos and info please see our facebook page "Te Maika Beachfront Ngunguru"
Nicely furnished open plan living areas. The house is split level with the lounge, dining and kitchen at ground level and facing the view. The 3 light and airy bedrooms are up a half level behind the living area and are cool and peaceful in the summer. Cosy in winter. The bathroom and separate toilet are on the bedroom level. 2nd TV upstairs with DVD player. Selection of DVDs. Stereo with Ipod dock. 10 min easy walk along waterfront to Shops, Cafe, Golf course, Tennis courts, Sports Bar. Stroll straight off the front lawn for a walk through 3 riverside bays to Whangaumu/Wellingtons Bay or a spot of fishing in the evening. Plenty of parking for boats/trailers. Property suitable for under 5 year olds only with good supervision. Beachfront is not fenced. Christmas through January we would prefer 5-7 day bookings, however we will consider bookings of 3 days+ if available closer to the time. Please note base rate price is for 2 guests. Extra guests are $20-$25 per head depending on the season. Property has self contained flat behind currently occupied by one person. Your complete privacy will be respected. Separate parking areas etc. Linen and towels provided but guests are requested to bring their own beach towels. Guests are requested to leave place reasonably clean and tidy. All rubbish to be removed to nearby recycle station. Beautiful Sea and Bush Views. Private and Quiet. Bathroom with shower. Separate toilet room.